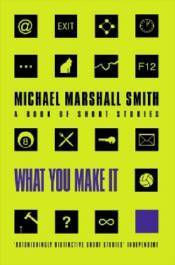 The first ever collection of Michael Marshall Smith's award-winning short stories. The first piece of fiction Smith ever wrote - a short story called The Man Who Drew Cats - won the World Fantasy award. It's included here along with many others, some unpublished, which show the incredible versatility of one of the most exciting writers working in Britain today. The collection is stuffed with surreal, disturbing gems including: 'When God Lived in Kentish Town' Someone comes up to you when you're quietly eating your stir-fried rice in a great Chinese take away, and tells you: 'I've found God'. You try to ignore them, right? But what if they have, and what if He works in a drab old electrical store on Kentish Town Road and he's not getting many customers? 'Diet Hell' Some people will do anything to fit into their old jeans. 'Save As...' What if you could back up your life? Save it up to a certain point and return to it when things went horribly wrong? 'Everybody Goes' An idyllic childhood day from a long, hot summer. The kind you want to last for ever. All good things must come to an end, mustn't they?